Being Frugal and Making It Work: Frugal Shopping: Earn Cash Back When You Shop Online PLUS $10 Cash Back Bonus Just for Joining! 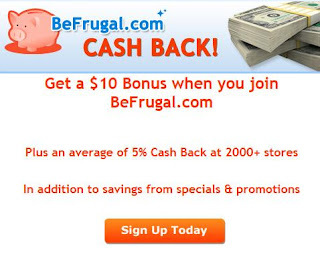 Frugal Shopping: Earn Cash Back When You Shop Online PLUS $10 Cash Back Bonus Just for Joining! Don't make an online purchase before checking your promotional codes and coupons first! BeFrugal.com offers free coupons and Cash Back, with an average rate of 5% at 2000+ online stores. For even more savings, sign up for a free account now and get a $10 bonus. Hurry! This $10 bonus offer is only available for a limited time. How do I Earn Cash Back at BeFrugal.com? That's all you need to do. Your Cash Back earnings will be automatically added to your BeFrugal.com account.